Do the prices on your website include installation? Yes, all pricing on the website includes delivery and installation, on level ground. If you need the unit to hold a certain wind/snow load rating for pulling a permit, please call in for accurate pricing. We also offer a self install discount or pick up discount for materials picked up at our Riverside, CA factory. Do you service my area? We provide installation or deliveries anywhere in Southern California, as far north at Bakersfield, CA and some areas of AZ (along the CA/AZ border). If you're close to any of these outer areas, please call in to confirm if we service your area before placing an order online. Otherwise anyone can pick up materials from our Riverside factory, which can be built and ready within 3-7 business days, depending on size of order. After ordering my carport or steel building, how long will it take for delivery? The turnaround time will vary depending on your location and size of your job, as well as the time of year. Please call in and speak with a sales rep about the current turnaround times. Is it required for me to have a concrete slab to order a carport or steel building? No. We offer mobile home anchors at an additional cost to secure a unit being installed on dirt, gravel or asphalt on structures up to 30' wide. All structures over 30' wide will require concrete footings or full slab/footings to bolt the unit down. When pouring my concrete, what size should the slab be? If your structure is fully enclosed with doors, we highly recommend it being the exact size of the framing, to avoid leaking between the base rail and concrete. If you are purchasing an open carport, the concrete slab should be a minimum of 6” wider and longer in each direction than the overall unit size if your structure is open (roof only). What is the maximum leg height I can have on my structure? United Carports can Install up to a 16’ leg/sidewall height. Please call in for pricing on 13'-16' legs, as the website does not show costs over a 12' height. Depending on the width, your peak height will usually be 2’-3’ higher at the center compared to your leg height. Can adjustments be made to the legs if the ground is not level? Our installers can adjust the legs up or down 2”-3” on the bottom rail of the carport or steel building. If your area exceeds that, please call in and speak with a sales rep on your options. Level ground is preferred for when our installers show up on the install day to avoid additional fees. What is the roof pitch of my carport or steel building? It is approximately a 3/12 pitch. The roof pitch will vary a little depending on the width of your carport or steel building structure, and a custom pitch can be built upon request at an additional cost. Why is the vertical roof style recommended when structures are longer than 31'? Units over 31’ long will have a seam in the middle of the roof on Standard or A-Frame Styles (horizontal panels). The Vertical Style Roof is highly recommended which can avoid seams and potential leaking down the road. If you do NOT go with the recommended Vertical roof, a waiver is required to be signed with no leak warranty. What are the dimensions on my carport from side to side? For example: If your structure is 20’ x 41’, the building will measure from outside to outside of the 20’. For the length, the building has 6” of overhang of roofing on the front and back. This will make the measurement of the baserail outside to outside 40’ in length. Can we install the carport ourselves and is there a discount? Yes. In most locations, we will drop off the unit and issue a discounted rate on your order. You can also pick up the materials at our Lake Elsinore factory for an additional discount and quicker turnaround time. Generic installation instructions are available to help you through the installation process. Can I add options on to my carport or steel building once I’ve installed? Yes, but there will be a return trip / delivery fee and is typically more expensive than order these upgrades up front when your original install takes place. After ordering my carport is my deposit refundable? United Carports does not give refunds on deposits after 7 days. You are provided with a three-day right to cancel under the "Home Solicitation Sales Act" with your contract for a full refund. Within the 7 day grace period all monies will be refunded except for a transaction and processing fee of $50 or 25% of the deposit amount, whichever is greater. United Carports reserves the right to cancel any order placed through unitedcarports.com for any price discrepancy over $20. Will my carport or steel building be anchored to the ground or my concrete slab? Yes. If the structure is being installed on concrete, we will use wedge anchor bolts to secure the structure. If your structure is being installed on dirt or gravel our engineer will determine how many auger anchors you will need to meet your local wind and or snow loads. Auger anchors are an additional charge of $50 each. A-frame Trim: A-frame trim is used as a finishing touch on boxed eve carports. The trim provides a boxed eve look. Vertical Trim: Vertical box trim is used as a finishing touch on Vertical style roof carports. This trim provides a nice boxed in look. Base Rails: The rectangular tubing that the legs of the carport sit on. Bow / Truss: A bow is a single piece of rectangular tubing bent to make the roof of the carport. Concrete Anchors: Also called wedge bolts or strong bolts, these are used when a carport or steel building is installed on a new or existing concrete slab. Corner Braces: Corner braces help reinforce the shear movement from side to side. The quantity and size of corner braces included on your unit free of charge will depend on the height and width. Gable Ends: A horizontal panel that extends from the top of the legs up to the peak, to cover the triangular opening on the end of the structure and give you a squared off entry. Also, we can install an extended gable end which is an additional panel for extra coverage. Garage Door / Roll Up: Our doors roll up into a cylinder above the opening rather than pulled back along a track like traditional home garage doors. Additional leg height may be needed to fit the door of your choice. Header: Headers are used to support the weight of the trusses when the openings or cut-outs are on the side of the building. L-Trim: This is used to cap the ends of regular style carport to provide a finished look. L-Trim is also used around the edges of the garage doors, walk in’s, and windows. It is also used on portions of the A-frame model carports. Legs: Legs are the wall framing tubes that elevate the top portion of the carport. They connect with the bows / truss to support the roof. Mobile Home Anchors: 30” auger anchors made to secure the carport when it is being installed on the ground/gravel/asphalt. Mobile home anchors cannot be used for installation on concrete. Paneling: Panels are 29 gauge steel and are 3' wide by our standard lengths of 21’, 26’, and 31’. 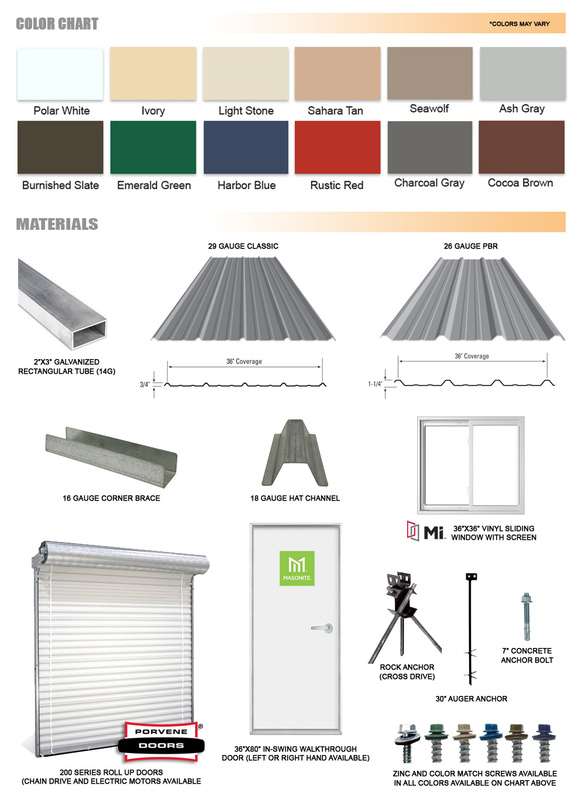 Panels are available in all colors above, at no additional cost. Peak Braces: Peak braces are installed at the center bend of the bow on all structures to reinforce the roof. They are also sometimes referred to as center braces. Rebar Pin Anchor: Rebar anchors are approximately 3’ pieces of steel with a 5/8” nut welded on one end, which is used to anchor the carport temporarily to the ground and asphalt. It is highly recommended to do your own anchoring afterwards if you're in a windy area. Ridge Cap: Ridge caps are used on vertical roof carports to cover the cap at the peak of the roof where each side of the roofing panels meet. Tubing: Our carports are made with 14 gauge 2” x 3” rectangular tubing and hold a 20 year limited rust through warranty. Walk in Doors: Our walk in door size is a 36” x 80” standard exterior home door. They are primed white and only available as swing-in. Right or left handed swing in can be ordered upon request. Windows: When installing optional windows, the standard window size is 36” x 36”. We offer three different roof styles. © 2017 United Carports LLC. All Rights Reserved.